When I (Steph) was younger, cleaning my room was something I hated dreaded. I have certainly grown up and do keep a (somewhat) tidy room, but I often have to be in the mood to clean. Sometimes, I even get in a super duper clean out the closet, rearrange my space, deep cleanin’ kinda mood. (Anyone else ever have those times?) Well, a few weekends ago, I was in that kinda mood, and I rearranged my bedroom. I have a huge stack of magazines that I’ve saved, because “Maybe there’s an article I might want to read again“, or “Maybe there’s a recipe I want to try.” Excuses, Excuses. Let’s face it, there’s probably nothing in these magazines that isn’t online. So, over the weekend, while it was cloudy and grey, I decided to start going through the pile that remained by my bed. Now, I probably should have just thrown them all out recycled them, but JUST TO BE SURE I wasn’t missing out on anything, I felt the need to go through them. 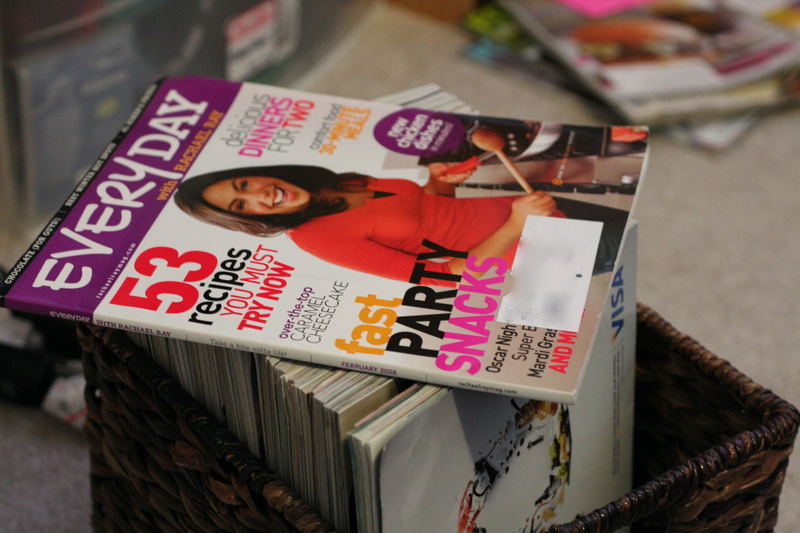 Oh, and while I’m at it, I should probably go through the selection of Rachel Ray and Food Network magazines that I have neatly stored in my living room too. Yes, I have kept A LOT of magazines. In my defense, I’ve kept a few of the magazines because I do actually refer back to them, like the issue of Everyday that has that meatloaf recipe I really like, or the issue with those Christmas cookies that were a hit last year. 🙂 But, do I REALLY need the ENTIRE magazine that contains those recipes? Probably not. So, I started weeding my way through the magazines, tearing out an article here and a recipe there. I was trying to keep it to a minimum people, I promise! The goal was to get rid of the magazines! Being that most of my magazines are food related, I was starting to get hungry spotting some really tasty recipes, including one that um, may have distracted me from my cleaning frenzy. Maybe it was the gloomy weather, but when I flipped through the October-fest issue of Everyday and spotted the recipe for Giant Bavarian Pretzels, I decided I needed to make them. Right now. 2. 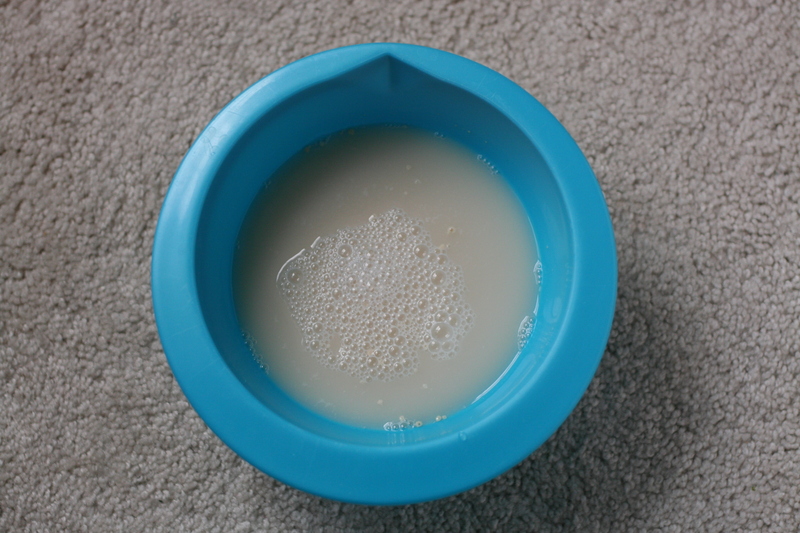 In a small bowl, whisk together the water and yeast. Let stand for 5 minutes. 3. In a large bowl, stir together the flour, brown sugar and table salt. Mix in the egg yolk, butter, and yeast mixture. The original recipe says to do this in a mixer fitted with a dough hook, and let it go on low speed for 5-7 minutes, until the dough is smooth and elastic. I decided that I wanted to mix this by hand. Bad idea. Kneading dough is HARD!! Especially after you’ve done an arm workout at the gym that morning! Eventually, I got it to the place I thought it should be, and moved on. 4. In a large, shallow baking dish, combine the baking soda with 2 cups warm water. 5. Divide the dough into 6 pieces. Using your hands, roll each into a rope about 42 inches long. Note: I thought that this would be a cinch. I mean, I was a rockstar at rolling play-dough into spaghetti-like ropes. 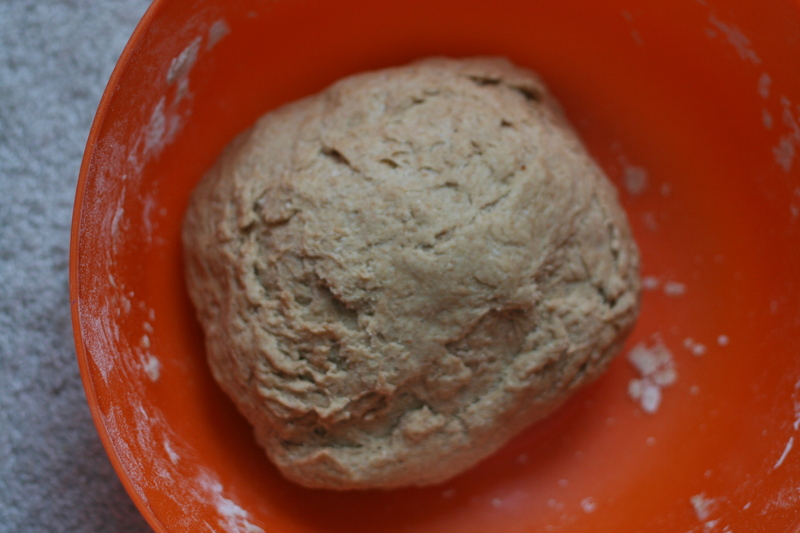 Maybe I hadn’t kneaded the dough enough in step 3, or maybe I’m just a poor roller, but I was unable to roll a 42 inch rope. I was able to get it to about 6 inches, and a picture of it is not appropriate for the blog. So, I changed technique, and let gravity help me. I held the dough vertically, and squished it into some semblance of a rope; however, 42 inches was impossible for me. 6. Dip the rope into the baking soda mixture for 30 seconds. 7. 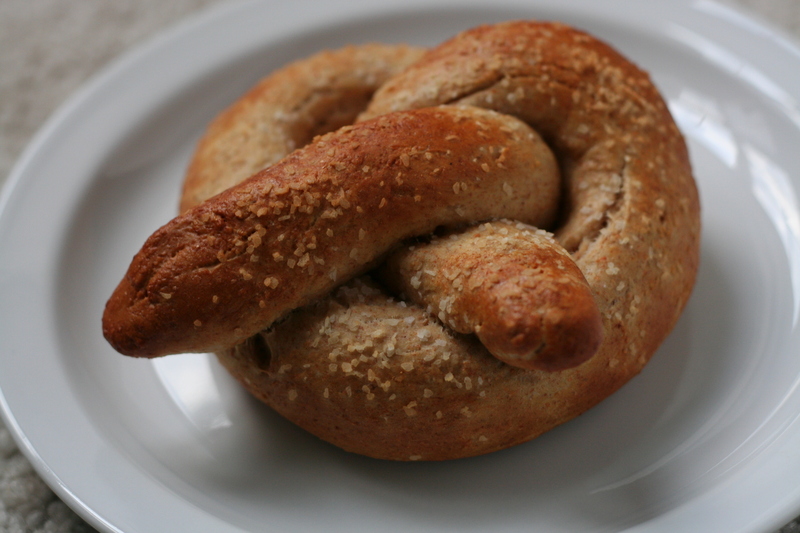 Twist your pretzel (or whatever shape you are making) and then place it on your prepared baking sheet. 8. Whisk a tablespoon of water into the egg white, and brush it on the pretzels. Sprinkle salt on top. 9. Bake for 12 to 15 minutes. One more note- After my unsuccessful try at creating a long enough rope to twist a pretzel, I made a few smaller ones, and some circles that looked like bagels. I also experimented with putting some raisins in the dough, and topping with cinnamon sugar. Both adventures were successful, but I didn’t snap any photos. 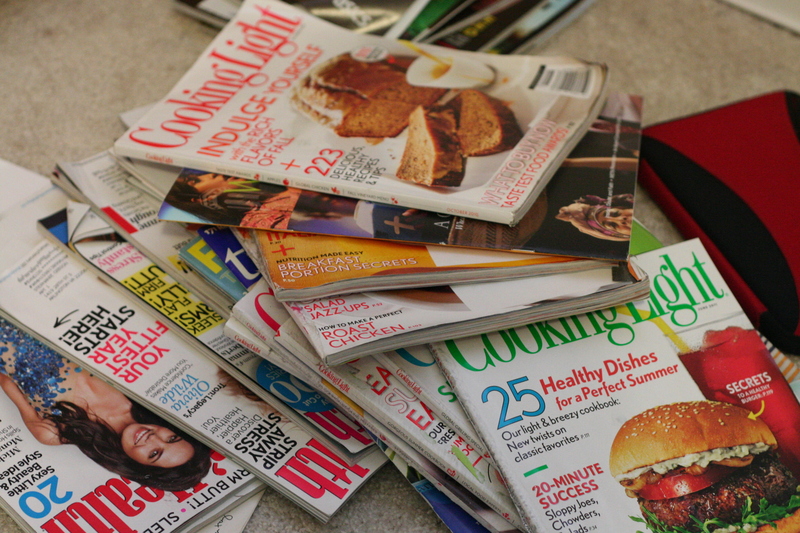 Question of the day: What do you do with your old magazines? I like to take the fitness magazines to a local gym. They always needs reading material. You may have to take them little by little… don’t want to overwhelm! What a good idea!! Thanks Signe! Pretzels go with margaritas, right? How inspired is that!? I usually get rid of old magazines…unless they’re food mags :). I’m like you – never know when you might need a recipe! So I have no tips for getting rid of them since I’ve got a giant stack in my closet at the moment :). I just made a dent in my stack of magazines this weekend! I have so much farther to go but, it felt good. Got me inspired to cook/bake. These pretzels look to die for. I am bookmarking these and making them. Thank you. I do crave the salty deliciousness of a Bavarian pretzel every once in a while. I also love a salty + sweet combo. I think these would be good with some honey butter or other sweet dipping sauce! These look so great– Thank for showing that not everyone can make them look perfect. 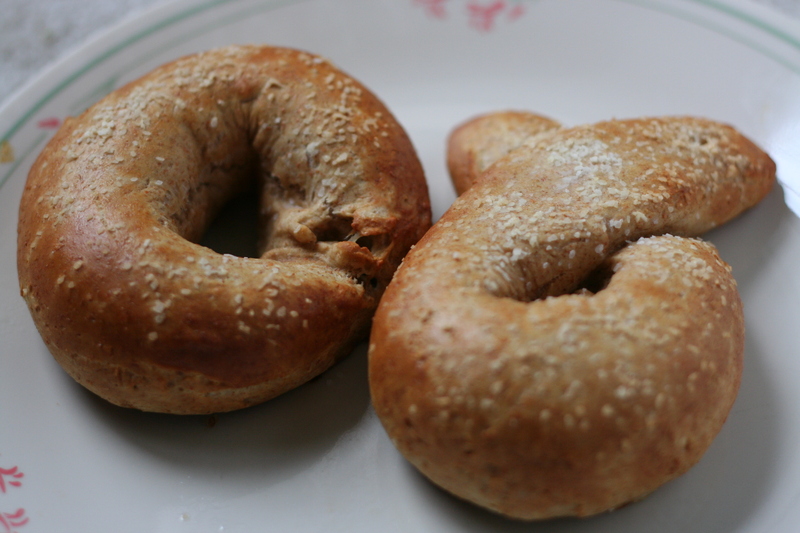 I’m about to make pretzels–so this post is def. a booster. Thanks! They’re tough to shape! I definitely picked the best picture for the blog:-) Making unique/different shapes is also fun! YUMMMMMMMM. These look SO good. way to make me starving for a pretzel at 10 am;). Hehe. Haha it totally hit the spot! I should make them again for after the race on Saturday!